The 200-05103-45 Wind Monitor-Alpine offers the performance and rugged construction of the standard Wind Monitor with the added benefit of an ice-resistant coating on external surfaces. The 200-05103-45 Wind Monitor-Alpine offers the performance and rugged construction of the standard Wind Monitor with the added benefit of an ice-resistant coating on external surfaces. It promises improved survivability for the most severe wind measuring applications. 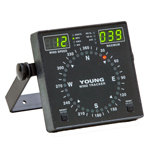 The wind direction sensor is a rugged molded vane. The wind speed sensor is a four blade helicoid propeller. Propeller diameter is slightly reduced from our standard model to minimize vibration at high speeds. External housing surfaces are coated with a specially formulated, Ice-resistant coating to improve performance in harsh alpine conditions. The all-black color scheme further enhances ice-shedding performance of the sensor. The instrument is made of UV stabilized plastic with stainless steel and anodized aluminum fittings. Precision grade, stainless steel ball bearings are used. Transient protection and cable terminations are in a convenient junction box. The instrument mounts on standard 1 inch pipe. A mounting orientation ring assures correct realignment of the wind direction reference when the instrument is removed for maintenance. The Wind Monitor-Alpine Model is available with two additional output signal options. Model 05103V-45 offers calibrated voltage outputs, convenient for use with many dataloggers. Model 05103L-45 provides a calibrated 4-20 mA current signal for each channel, useful in high noise areas or for long cables (up to several kilometers). Signal conditioning electronics are integrated into the sensor junction box. AC sine wave voltage: 3 pulses per revolution. Azimuth: analog DC voltage from conductive plastic potentiometer, 10 K ohms, resistance, .25% linearity, life expectancy 50 million revolutions. Potentiometer excitation 15 Vdc maximum. 0-50 m/s Add suffix M"